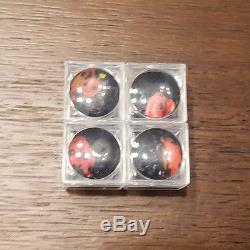 These are four (4) screen used props from the 2002 hit movie "Spider-Man". These were used in the actual production of the film, and can be seen in the laboratory in the beginning of the movie. Each plastic box measures 1"(L) x 1"(W) x 7/8(H) and has a magnifying lid. Inside you'll find one plastic ladybug in each box. The boxes come with a letter of authenticity (LOA). The item "Spider-Man Movie (2002) Four Bug Boxes Screen Used Props" is in sale since Saturday, July 1, 2017. This item is in the category "Entertainment Memorabilia\Movie Memorabilia\Props\Originals". The seller is "thebeckychick" and is located in Portland, Oregon. This item can be shipped worldwide.